Lavish coffee-table animation art books are usually the prerogative of theatrical features from major animation studios like Disney, DreamWorks Animation, and Pixar; not a TV cartoon series from a studio like Cartoon Network. Yet if any TV cartoon series has earned that accolade, Regular Show has. The prime-time (7:30 p.m.; new episodes on Thursdays, reruns the rest of the Monday-Saturday week) half-hour program of two 11-minute episodes began on September 6, 2010, and is still going strong with 195 episodes (nine seasons) scheduled so far, and a made-for-TV feature, Regular Show: The Movie, due on November 25, 2015. Episode #58, “Eggscellent” by Regular Show creator J. G. Quintel, won a 2013 Emmy Award in the Outstanding Short-format Animated Program category; and various other episodes have been nominated for Annie, Emmy, Teen Choice, and other American and British TV awards. There have been a Regular Show monthly comic book since May 2013; and video games, action figures, plush dolls, bobbleheads, T-shirts, and more. Regular Show carries anthropomorphism to an extreme. 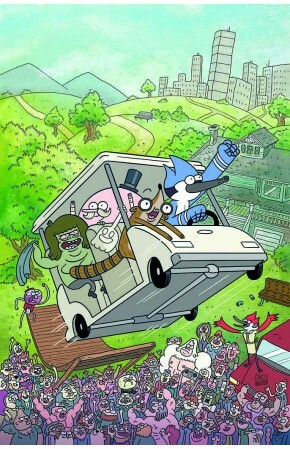 The series’ regular (ha, ha) stars are Mordecai the blue jay and Rigby the raccoon. They work (or try to avoid working) for park manager Benson, an uptight anthro gumball machine. Their friendlier co-manager is the older Pops, a mustached anthro lollipop from Lolliland. Other regular co-groundskeepers are Skips, a yeti; Hi-Five Ghost; and the big green Muscle Man, not quite a parody of Marvel comics’ The Incredible Hulk. Supporting characters are Margaret, a red-breasted robin and Eileen, a mole, two waitresses at a nearby coffee shop; a bowling, arm-wrestling Death; Thomas, a goat teenage intern; CJ, a cloud (Mordecai’s girlfriend); eight party-loving unicorns; four karate-chopping baby ducks who can combine into an anime-giant-robot-parody Giant Duck; or anthro pretty much anythings. This large full-color book (11.4” x 8.9”; 160 pages) is about the cartoon art for the Cartoon Network’s Regular Show animated TV series. It is written by Shannon O’Leary, a writer for Publishers Weekly covering the animation and comics industries, with a Foreword by J. G. Quintel who created the series, and an Introduction by Paula Spence, the series’ Art Director. If you’re a fan of the TV animated series, you pretty well have to have this book. It’s available at a 45% discount from Amazon.com.